The deadline to register for the next PACCC exams is Thursday, May 31,2018. You still have time to join the growing ranks (over 100!) of independently certified pet care professionals. 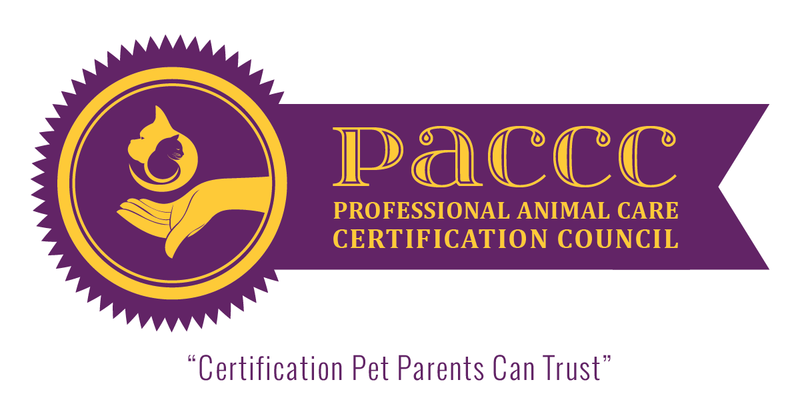 The Professional Animal Care Certification Council (PACCC) offers its next round of independent certification exams for pet care professionals committed to the advancement of pet safety. When are the next PACCC exams? June 16 – 30, 2018. But the deadline to register is May 31, 2018. Where are the next PACCC exams? That depends. Where are you? PACCC exams are held at multiple approved testing sites. We’ll tell you how to find your nearest testing site at the link, below. Which exams are being offered? You can test to become a Certified Professional Animal Care Provider (CPACP), Manager (CPACM), or Operator (CPACO). Not sure which exam to take? The link, below, will guide you to the answer. Why does getting certified matter? The fact is, right now, the pet care services industry is a rapidly growing, easy to enter one with that has been slammed with negative news reports of serious pet accidents and deaths. Those CPACP, CPACM, or CPACO credentials behind your name set you apart from the crowd and let pet parents and industry colleagues know that you possess a broad base of animal care knowledge – enough, in fact, for an independent tester to certify you. How many pet care pros are currently certified? When our Certified Directory is next updated at the end of this month you will see more than 100 PACCC certified professionals! How much does it cost? The CPACP exam is $350. The CPACM exam is $450. The CPACO exam is $550. Professionals who pass the certification exam receive a 3-year certification. Already certified or registered or an industry vendor? We need you to spread the word to pet care professionals who care about pet safety that there is still time to become certified. Please share! Still need more information? We have a recorded webinar, About PACCC: Why Independent Certification Matters to You and the Pet Care Industry, you can watch on YouTube and/or you can download the presentation as a PDF. Get the video or the download here. We’re also here to help you one-on-one, just email help@paccert.org. READY TO GET STARTED? Just CLICK HERE to visit to the PACCC website page for complete details to register!